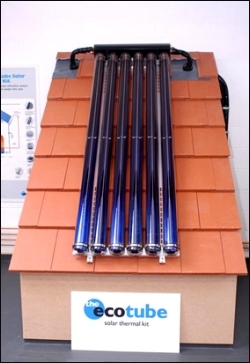 Solar Thermal Rigs are designed and built by Sabre Rigs Ltd for use as training aids for use in MCS and Green Deal accredited training courses. These rigs can also be used in a showroom situation for demonstration purposes. Sabre also supplies a wide range of testing equipment, service tools, training aids, practice and installation kits and solar filling and flushing pumps used when implementing a Solar Thermal installation. 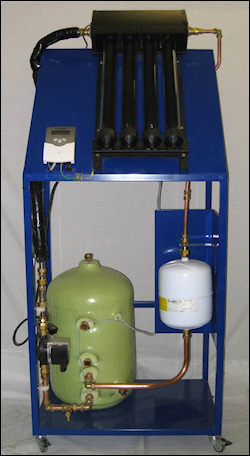 This rig is ideal for introducing faults in the system for assessment purposes. It is designed to be moved through standard doorways. It has robust, lockable wheels and a 2 metre mains lead. The solar collector comprises six Ecotubes with manifold, mounted on an angled frame. Stainless steel flexi-pipe provides flow and return connections between solar collector and pump station, whilst standard copper pipe work and pressure fittings are used to link components within the remainder of the sealed system. The Pumping Station Gauges positioned on flow and return pipes enable a visual check of heat transfer fluid temperature. 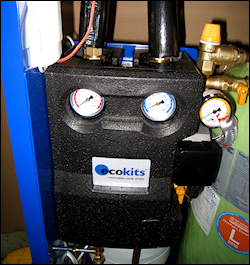 A third gauge, located below the PRV enables system pressure to be monitored. Flush and fill valves are positioned either side of the solar pump. 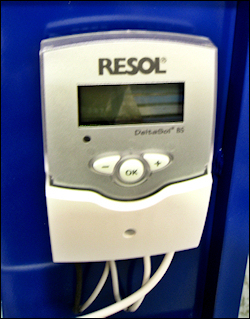 The Resol controller (Mounted on side panel) is operated and programmed via three push buttons located below a LED display. Dry pocket sensors located at the solar collector and cylinder (Heat store) enable temperature differences to be monitored and programmed. Flow Setter - Used to set maximum flow rate by adjusting the speed level of the solar pump. Heat Transfer Fluid - A mixture of water and 40% polypropylene glycol is recommended. See above except with a Flat Plate solar collector. 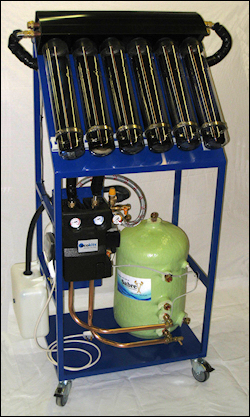 The drain back system rig is assembled on a mobile frame similar to the Evacuated Tube Direct Flow Solar Rig. 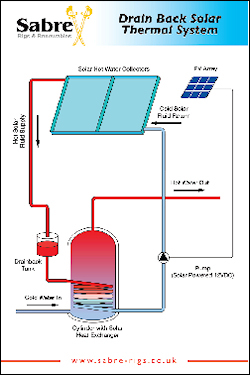 The conventional flat plate collector system simulates the basic solar installation that allows the heat transfer fluid to be drained from the collector at sub zero temperatures. This system is widely used in Mediterranean areas. 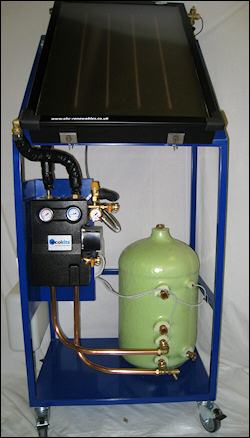 The Training Rig includes a flow setter, circulating pump, an 8 Litre Drain Back tank and sensors positioned in the solar collector and the cylinder. It is designed to be moved through standard doorways. It has robust, lockable wheels. 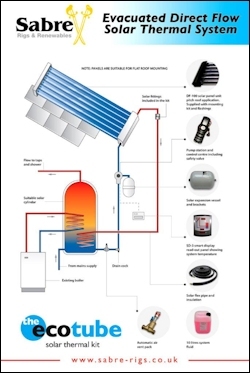 See above, except with Heat Pipes as a solar collector. 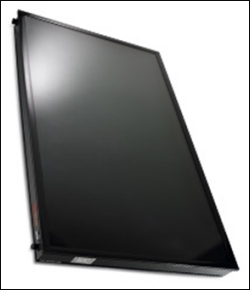 This is an ideal demonstration tool, comprising 4-tube mini display module with header, supported by A-Frame. It is supplied in flat pack form, complete with fixings and a set of step-by-step instructions for quick assembly of the display module. Each heat pipe tube can be quickly dissembled and stopper easily removed in order to reveal the inner workings i.e. high conductivity copper heat pipe condenser & aluminium heat transfer fin. The inner evacuated wall within the borosilicate glass tube and (triple layer) selective absorber coating can clearly be identified. It should be pointed out that there is no water flow in the evacuated tube during the pressurized operation, so water scale and tube exposition within the system are avoided. An excellent training aid comprising a single display Ecotube solar evacuated tube supported on a stainless steel mounting cradle. 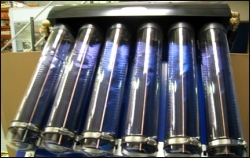 It enables close up examination of the inner workings of the evacuated tube, including the inner and outer copper tube, through which heat transfer fluid (Glycol) passes, and the absorber plate with wavelength-selective coating. 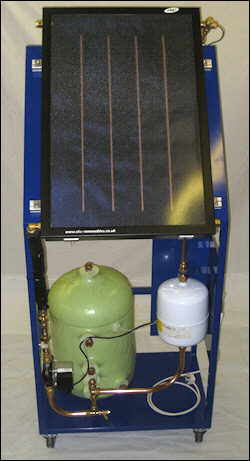 Comprising flat plate solar collector (2m x 1m), installation kit & roof frame - intended solely for training purposes i.e. to practice installation and dismantling of the solar panel on a mock roof set up. ** Please note: mounting frames will be supplied to suit a specified roof type, i.e. slate/tile etc. Ideal for installation practice - includes a single Ecotube solar panel (2m x 1m), comprising six Evacuated tubes & manifold, mounting kit/hangers, user manual & 12 step interactive CD. 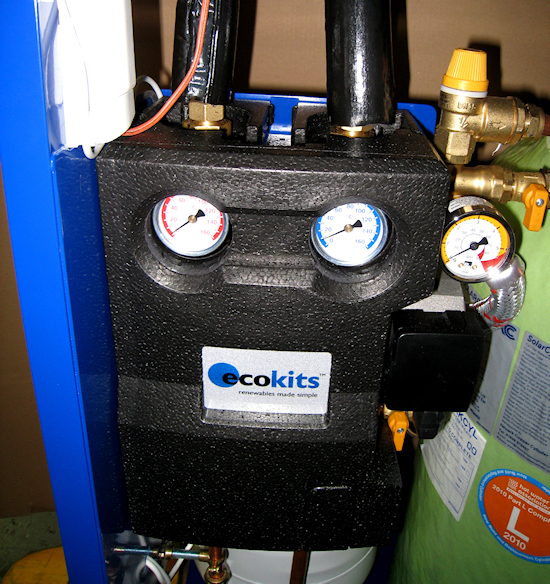 The mini module is approximately one square metre in area and comprises six Ecotubes, manifold and fixing hangers. 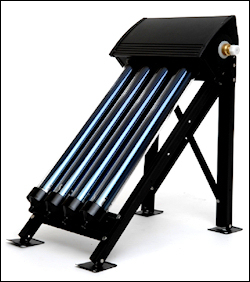 It is similar to the solar collector used on the Direct Flow Solar Thermal Training Unit. The two hangers supplied enable a secure fixing to the rafters and can be used for installation to both tiled and slated roof types. A DVD & installation instructions are also included. 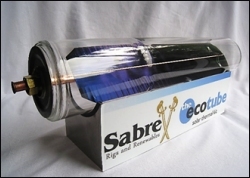 Sabre supply flat plate, evacuated tube (Ecotube) and heat pipe solar installation kits for fitting to pitched and flat roofs or walls. Flat plate kits are available for ‘on-roof and 'in-roof' installations on tiled or slate roofs. 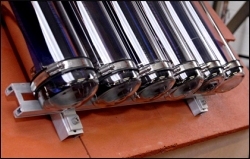 A range of twin-coil solar cylinders are also available upon request. Please refer to our website or contact us for further details or a quotation.